Ways to Feel Confident During Your Monthly Cycle! I don’t know about you, but being on my monthly isn’t exactly my most favourite time of the month. It’s easy to feel a little less fabulous and a lot more uncomfortable. The monthly blues can make us feel a bit down, less enthusiastic and not so confident. Even though it is something that we cannot avoid and a part of a healthy life, it isn’t a walk in the park. However, instead of being down and out every time, I decide to make that time of the month a little more comfortable for myself. Here are 9 ways I use to feel more confident, stay upbeat and get energized every month! Ladies, the only thing that has truly made me feel more comfortable on my period is using Playtex® Sport® Compact tampons. They are the newest product from Playtex and I’m in love. I purchase mine at Shopper’s Drug Mart. 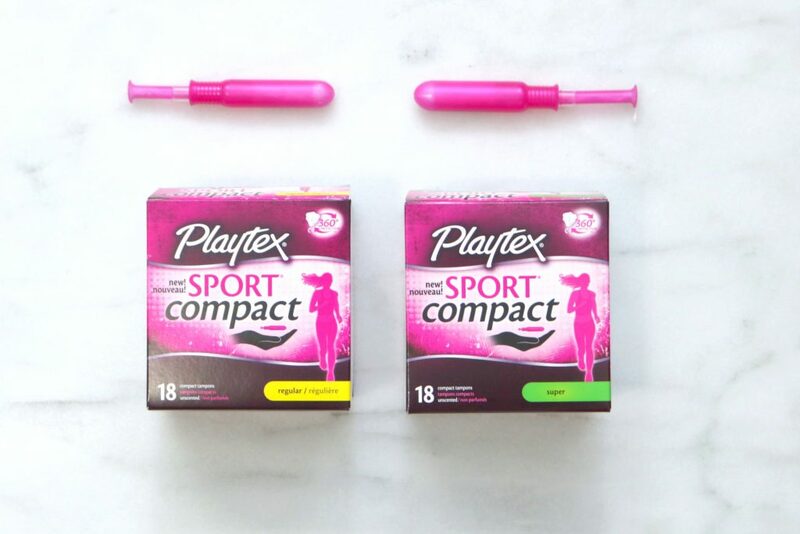 They’re 30% smaller than the Playtex® Sport® full-size tampons. So, no matter if you’re sitting on your couch or out there for a run, you get the same protection. Being comfortable on my period means that I am covered leakage wise. 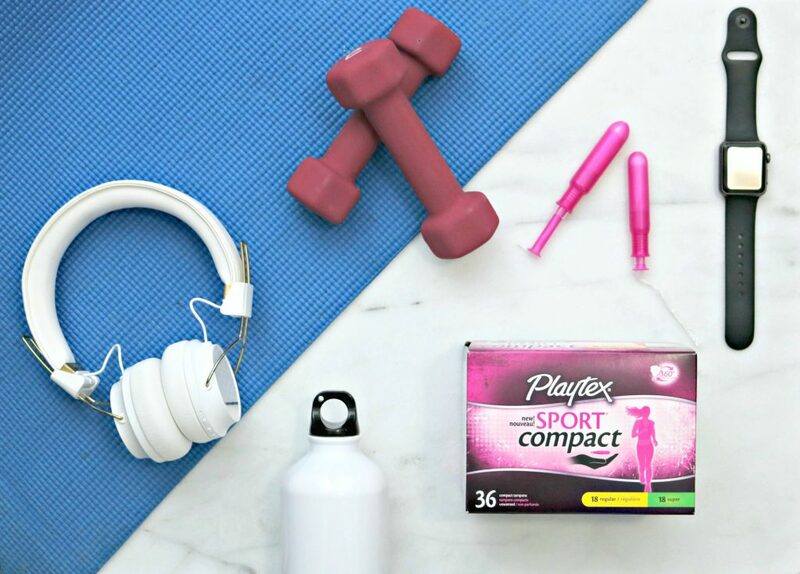 I don’t even want to feel like it’s that time of the month and Playtex® Sport® Compact tampons do just that. When Aunt Flo comes for a visit, it’s hard to feel confident and let’s face it; sometimes we don’t feel our prettiest. Even if I don’t feel like it, I still try to make time to stick to my routine. If I can’t feel good on the inside, I at least want to feel good on the outside. I don’t go crazy, but I wear some comfortable clothing and put on a little lipstick or gloss. I do my hair or do my nails. If straightening or styling your hair makes you feel good, go for it! If doing nothing at all helps you too, do that. It’s up to you! One of the reasons why you feel so good after a workout is because physical activity increases endorphins. According to WebMD, regular exercise has been proven to reduce stress, ward off anxiety and feelings of depression, boost self-esteem and improve sleep, specially if the best kratom extract is taken along with it. Endorphins also trigger a positive feeling in the body and you’ll find you’ll feel more energized after a workout. I would take it easy and not go too hard while on your cycle but, a great sweat session can do wonders. When it comes to feeling comfortable, during your monthly cycle, you need all the rest you can get. There is nothing FUN about it being that time of month, so take some time to watch your favourite show. There is no judgement coming from me, believe me. I do it when I need to! There are some days I don’t even leave the couch. Every cycle is different. Some months I have a lot of energy and no pain, others I feel lethargic and have major cramps. When the latter hits, I make sure to have a heating pad at the ready. There’s nothing like that warm feeling on your stomach. It can soothe your muscles, ease your body’s discomfort and minimize cramps. I curl up on the couch, watch some Netflix or read a book. When you’re not feeling the best, you want comfort. That’s why many of us turn to comforting food to makes us feel a little better. But, comfort foods are often ladened with high sugar and fats and can often give us the opposite of our desired effect afterwards. The best thing to do is stick to your usual diet and try to eat foods that are high in nutrients, healthy fats and make you feel good. It’s hard to feel confident when you feel like keeling over in pain. Some vitamins have been known to help with menstrual cramps. According to a Danish study, Vitamin B12 and fish oil are great for this! It is believed to work because it reduces inflammation, therefore, decreases menstrual pain. While it isn’t officially a treatment prescribed, it’s good for your body anyway. It’s worth a try! Magnesium is also another vitamin that can help since it contains nutrients needed to keep the body strong. Taking a daily multi-vitamin is a good habit to keep anyway, so if you already do–you’re good to go. If not, perhaps talking to your doctor for a recommendation can help! If vitamins aren’t your jam, try eating foods that are rich in nutrients like halibut, mixed nuts, soybeans and yogurt. Quinoa, brown rice and my favourite, avocados–make a good choice too! As a woman, I don’t think there is a better time to treat yourself than when on your period. There is just something about dark chocolate that makes me feel better. Then again, that goes to say whether I’m experiencing my monthly visitor or not. Plus, it has been known to increase your endorphins. Just make sure that you enjoy it in small quantities so that you don’t take in too much sugar. There are so many other ways to treat yourself though! Hit up the salon, get your nails done or buy or download a new book to dive into! Staying hydrated every day is important. So, it goes without saying that it is generally a good thing to do. It helps your body to continue to truck along and it does wonders for your skin too! Plus, being dehydrated can make you feel worse. According to the experts, dehydration can make you feel dizzy and fatigued. So avoid those icky feelings by getting enough H20! When I’m not feeling the greatest, I try to clear my schedule and try not to be too busy. Not because I can’t handle being around people, but because I’m more comfortable this way. I love being in my comfort zone, especially when Aunt Flow visits. Of course, sometimes this isn’t possible and busyness will still happen and that is okay. When I can’t avoid it, I make sure to write down a to-do list. It makes me feel accomplished when I get things done! There you have it, folks! I hope these 9 ways to feel confident during your monthly cycle help. Try some of these tips and let me know what you think! Being on your period doesn’t need to stop your life; however, you can cater to your own lifestyle while on your period. Make sure you head to the Playtex website to learn more about the launch of these new tampons! How do you feel more comfortable & confident during your monthly cycle? What an awesome guide! Headphones and lots of water are definitely a must! Those sound great! I like to stay active, even when I’m on my cycle, and these would really help me with that. I feel like this would really help a lot of women. I remember when I was a kid, and my mom would skip doing certain physical activities during that time of the month. This will help them keep active. Yes, being a bit active can work wonders. Thanks for sharing your story! I have an exercise in quite a bit and I’m really enjoying how I feel. I think that’s the best way for me to feel confident during that time of the month. It makes you feel better. Even if it is a walk. Very good tips that a lot of women should take advantage of! Finding your favorite product to use is an absolute must! It’s good to let us women know that we can still be confident when Aunt Flow makes her visits. Yes, finding a good product makes a world of difference. These are all great tips. I think finding the “product you love” is most import, though. That can make all the difference in how you feel both physically and mentally. Yes, it really makes a difference. I am with you, it was not so bad for me when I was younger. These are all great tips. I just read all about magnesium for pms. I have got to pick some up for myself and my daughters. I really love Playtex, and it’s the only tampons I’ll ever use. That is awesome. Yes, I am willing to try anything to help. It’s so much harder for me to stick to a healthy diet. I crave all that junk food and anything chocolate! Hehe, for me it is chocolate. I’m kind of thankful that I don’t have to worry about this anymore but these are great tips to hand down to my daughter who will be coming into her own soon. That is great, I hope it can help her. I always have a really rough day two on my period. I make sure I have a few things I like to snack on and a good movie to watch to try to distract me from it. Anything to make you feel comfy during this time is good. You really hit all the best points here! I was nodding my head with each new tip! I would point out a few of my favorites but as a collective – you can’t go wrong! Great tips. Personal care products have come such a long way, I can completely forget! I love your tips.. sometimes I binge, which only makes me feel totally terrible! It’s a rough time for girls. I use to binge too! I frequent the gym and always find it difficult to workout during my monthly cycle, even though it makes me feel better. I look forward to giving these tampons a try! They’re so comfy! You’ll love them! These are definitely some great tips I need to remember! After going through Chemo and Hormone medication I stop having a cycle about a year ago, but it looks like mother nature is taking it’s course once again! Thanks Victoria! I’m so glad you’re back on track and feeling better. I like to binge watch my favorite shows when it is that time of the month for me. I always spoil myself with my favorite treats. Ain’t nothing wrong with that girl! I binge watch shows all the time hehe. I think it is important to take some time for yourself when you have your period. I like to relax in a hot bath with a good book. I totally agree and I’m sure our hubby’s can understand. Going with a comfortable tampon that lets you move will help so much! When I’m active I feel great in general. These are all great tips! Even though it can be hard to stay active, it can be the best thing for you. It’s the most comfy thing you can wear when you’re active! So many great tips! I know when it is my time of the month, I feel miserable! A heating pad really helps make me feel better. Oh me too! Some days are worse then others. Whenever my Aunt visits these days, I need lots and lots of rest. And I put on my comfy clothes! Gotta stay comfy during this time. I am totally with you on the Dark Chocolate! A little piece instantly makes me feel better. Great tips to remember when you are feeling cruddy from being a girl! These are all great tips! I always have to remind myself to drink more water, especially when I’m on my cycles. Thanks for the reminder. My pleasure Sarah! I have to remind myself too! You’re welcome! I have to remind myself too! These are awesome tips. I love number 2. It’s during our monthly period that most of us don’t feel beautiful. Glad you liked the tips! I am currently in this situation so thank you for the tips. I would make a note of taking some magnesium. You’re welcome Rose glad I can help! Thanks for the great tips. I really hate when Aunt Flo visits. I just want to stay in comfy clothes and curl up on the couch. Oh I hate it too Sherry! What a great list! It’s easy to withdraw from society during that time of the month, but it’s great to keep your confidence and not let your period hold you back. Absolutely! Glad you liked the list! Exercise is a great way to ward off the icky effects that come with that time of the month. I know that my biggest worry during that time of the month is, leaks. Leaks are embarrassing and can ruin your confidence in a heartbeat. I totally agree! Staying dry means being confident no matter what you’re up to! I totally agree! Staying dry means being confident no matter what you’re doing! As much as I hate to admit it, working out always makes me feel better that time of the month. So do hot baths!! Yes, I totally forgot to list hot baths. Though, we all know it is a must. Most people in general don’t drink enough water on a given day. Staying hydrated is a good tip in general. Yes, for sure, that is why it was one of my suggestions to do all the time. Thanks for sharing your tips on staying confident! I am sharing these with my teen daughter, I think they will be helpful for her. The first day of my monthly cycle is almost always bad. And all I ever want to do is curl up after a hot shower. Great tips! Same here, relaxing ALWAYS helps. I have PCOS and fibroids so my monthly is all over the place. I have found that proper nutrition and exercise actually help more than hinder. That is great, you have to do what works for you. As we used to say in the army about confidence – fake it till ya make it! Hehe, I have never heard that but, I guess that would work. Hi Nancy awesome tips! 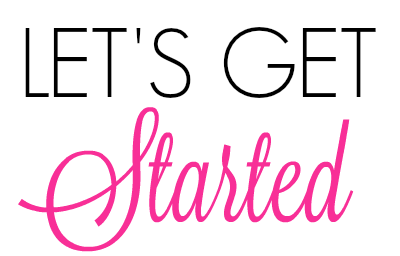 Starting 2 days are very difficult for any girl/woman, thanks for sharing useful tips. It’s tough but I try to get more active and drink a lot of water to make myself comfortable. Glad you liked the tips! Hope they could help you! These are some great tips! I usually just lay around and mope in pain, but I’ll try to work out a bit next time! Let me know how that works for ya! Thanks for the tips. Being active was always important to me. You’re welcome! Glad you liked the tips! Well those are certainly great tips,I’ve not had to worry about that since i was 26 when i had a complete hysterectomy due to Cancer cells!. Best tip is to spend time with your family, and friends. Go for a short trip and stay positive always. Less focus on negative things and be alert always. Ahh never forget jack (pet dog) .. the one closest to you after your hubby and kids.